As Bill Clinton might say, “It's the environment, stupid!” Our devotion to science, technology and the capitalist system has culminated in a unique moment in the human relationship with the environment. Our species is at or near the peak of a prosperity bubble about to burst. We have exceeded the carrying capacity of the biosphere and we are still breeding. (1) We are overusing antibiotics and deadly bacteria are becoming immune to everything we have. (2) We are mining our precious water resources (3), coral reefs are dying as the oceans become warmer and more acidic (4), and most alarming, we are experiencing this as the very beginnings of the negative consequences of climate change. It will include massive droughts and floods, freak storms, the spread of diseases (5), famine, water wars (6), and the elimination of 30 to 50% of the species. (7) Experts tell us we may have but 10 years max to turn the Titanic around with regard to the most devastating aspects of climate change. (8) The apocalyptic conditions we are inexorably moving towards are truly in the archetypal domain, requiring an archetypal analysis and suggestions for dealing with it. 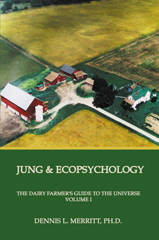 Enter Jungian ecopsychology, a topic I have been writing on for the past 16 years, having just published the third of the 4 volumes of The Dairy Farmer's Guide to the Universe—Jung, Hermes, and Ecopsychology. I discovered Jung while working on my doctorate in entomology in Berkeley starting in 1967. My area was insect pathology, using insect pathogens instead of chemicals to manage insect pests; Silent Spring had made a deep impression on me. Eventually I came to realize the ecological and political dimensions of Jung's concepts, and was able to bring my two backgrounds together within the developing field of ecopsychology. Psychology has been painfully late in addressing environmental problems. Jungian analyst and archetypal psychologist James Hillman summed it up in the title of his book: We've had a Hundred Years of Psychotherapy--and the World's Getting Worse. (9) He noted that the environment we have ignored and mistreated is making its importance known to us through its pathologies, much like human pathologies made the reality of the unconscious known to Freud. (10) The collective psyche of our species is deeply disturbed by our collapsing faith in science and the redeveloping human limitations in confronting nature, and it has been more a heroic confrontation than an enlightened relationship. The field of ecopsychology began to emerge in the 1990s. It examines how our attitudes, values, perceptions and behaviors affect the environment. It calls for a reformulation of our political, cultural, economic and educational systems to enable us to live sustainably. Like deep ecology, it maintains that we are capable of a far deeper connection with nature which will serve as a natural basis for protecting the environment. (11) Jung, who died in 1961, recognized the magnitude of the shift in consciousness necessary for these things to happen when he foresaw a paradigm shift coming in the West, what he called a “New Age” and the “Age of Aquarius” (12), a shift which will certainly and necessarily have an ecological base. There are two focal points from a Jungian ecological perspective for facing these issues. First is Jung's challenge to become more conscious, which for Jung meant to bring as much light as possible into the unconscious. It is clear this must now include greater consciousness of our niche in nature and greater awareness of environmental problems. This requires a knowledge of science as well as the archetypal dynamics of the apocalypse which will emerge ever more strongly, prompting more polarization in our society and a movement towards unreflective extreme religious positions. (13) The second Jungian ecopsychological focus is on the archetypal energies imaged by Hermes. Language and communication, Hermes' domaines, are being manipulated 1984-style by corporate interests using eco-propaganda, advertising, and “greenwashing.” One of the few hopes I have for humankind is for Hermes the communicator offering the possibility for easy and widespread dissemination of holistic messages and a new vision for humankind if we can develop one. Hermes leads the way or leads astray—it's our choice. To develop a new vision I propose that we create a team of experts from all fields who can communicate well with each other as they provide a deep analysis of our problems as a species and develop a plan all the world leaders can get behind. This team would include ecologists, psychologists, economists, spiritual leaders, scientists, technologists, educators, and indigenous peoples. Deep ecology calls for the deepest possible analysis of our dysfunctional relationship with nature, and Jung offers this through his examination of the evolution of the God-image in the West. (18) Myths and religions help establish and maintain basic attitudes, values, perceptions and behaviors, especially with regard to women, our bodies, sexuality and sensuality, and nature. Consciousness and every layer of the collective unconscious can be scrutinized for dissonance with regard to our relationship with the environment. (22) At the personal intrapsychic level, our relationship with the unconscious sets the pattern for our relationship with others and with nature, an example in complexity theory of scale invariance. Our family, especially attachment issues with the mothering figure, can lead to an anxiety, emptiness and a narcissism which consumerism and fundamentalist religions prey upon. Our national myths of the cowboy and conquering the wild West engender a conquering attitude towards nature and a religion of progress. Issues are compounded by the growing polarization in societies between believers and non-believers and the haves and have-nots. We are heading towards a dangerous period, especially in America, as it faces the archetype of decline—a problem for a country with an adolescent mentality epitomized by our myths of exceptionalism and the independent cowboy. Our hyper-independence makes us paranoid about any hint of socialism which many equate with communism. It is a revolutionary period (hexagram 49 in the I Ching) with the dangers of fascism increasing as economic, social and environmental conditions deteriorate. The Judeo-Christian religion established core values in Western culture which have little connection with nature, the body and sexuality. The Western Oedipal complex of human intelligence trumping the Great Goddess imaged as the Sphinx is poised to inflict the plagues of Thebes upon the entire planet and literalize John's apocalyptic vision. 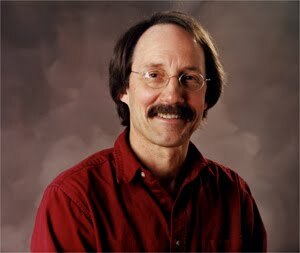 (23) Ecotheologian Thomas Berry described the Myth of Wonderworld as the myth of the West, now spread worldwide, as originating in John's Book of Revelation, the last book in the Bible. A thousand years of abundance and human perfections were supposed to precede the end of the created world. Humans decided to manifest the myth themselves when it didn't occur by divine grace. Berry writes, “The millennial myth was absorbed into, and found expression in, the modern doctrine of progress—which has seen humans trying to bring about this promised state through their own efforts by exploiting the resources of the earth.” (24) Jung challenges us to unite our cultured side with the primeval ancestors, what he called “the two million-year-old man within” at the clan and tribal level of human relationships. Such a person would have a relationship with the animal ancestor foundation of the psyche like an indigenous person speaks of spirit animals. The deepest disturbance in our collective unconscious will be at the animal soul level, because for the first time in the history of life on earth, one species will be responsible for eliminating 30 to 50% of the other species. And through the consequences of climate change we will decimate the basic requirements for our life as an animal: food, water, shelter and a relatively stable climate. Aldo Leopold described a science that deepens our appreciation of nature, helps us realize our ecological niche, and makes us aware of how we are destroying the environment. (25) We must realize that the climate change problem is a species problem, not just an American or European or Chinese problem. We must appreciate the unique niche of our species in nature as the only species able to use science and technology to violate the laws of nature and exceed the limitations nature brings about through restrictions of food, water, and the spread of diseases. This makes it imperative for our species to be conscious and wise in our relationship with nature and oriented towards living sustainably. "We are the Origin of All Coming Evil"
From the more cultural perspective, our educational systems must make us more cognizant of our cultural evolution, the evolution of our religious forms, and the archetypal dynamics of the God-image within. Jung said we need more psychology, and famously added, “We are the origin of all coming evil.” (26) We have to teach a psychology that educates students about archetypes, the shadow and projection, and how to live a meaningful life, for Jung proposed individuation as the best antidote to consumerism. (27) The archetype of the provider side of the Great Mother with her desire for stability has captured our species aided by the wonders of science and technology giving us an abundance of food, clothing, shelter, cheap energy and good health. The fatal flaw is our lack of wisdom and a lack of collective social and environmental consciousness. Environmentalists and most scientists have been suffering from the Cassandra complex for several decades so the problem is not with science. (28) Jung's claim that big corporations are the modern day monsters (29) provides an archetypal take on corporations as persons and the Citizen's United Supreme Court decision. (30) The British Royal Society sent two letters to ExxonMobil in 2006 chastising them for funding organizations deliberately trying to confuse people about climate change, attempting to convince the populace there was serious disagreement among scientists about the human factor in climate change. One ad agency was the same one hired by Phillip Morris in 1993 to create doubt that second hand smoke can cause cancer as the Surgeon General's report in 1992 had indicated. (31) In a related story, I quote from the end of the 2012 Frontline program on PBS, “Money, Power and Wall Street”: “It's very difficult to change gods, and in the modern age, our god is finance. Except its turned out to be a very cruel and destructive god.” A very real aspect of a paradigm shift will entail a revisioning of the concept of corporations. They have the rights of a person but with no concern for children, grandchildren or the seventh generation; their only goal is to maximize profits no matter what. Corporations and large financial institutions are now above governments and international politics. Without changing the rights of corporations, strict oversight of financial institutions, and the elimination of tax haven shell-games, we are just rearranging the chairs on the deck of the Titanic—they will always be several steps ahead of us. I describe on my blog also on this site how I see the film Hunger Games as an analogy to our present political situation veering towards fascism, defined as the union of corporations with government. This is conveyed in a quote attributed to Sinclair Lewis: "When fascism comes to America, it will be wrapped in the flag and carrying a cross," not written by Lewis but expressing his sentiments. Nothing is currently being done that is big and bold enough to address the gestalt of conditions that are producing climate change, conditions at the personal, cultural, social, political, economic, educational, and spiritual levels. I am firmly convinced that Jungian ecopsychology can make a significant contribution to this necessary dialogue. 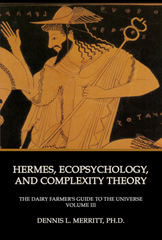 This has been the subject of my 4 volumes of The Dairy Farmer's Guide to the Universe—Jung, Hermes and Ecopsychology. Volume 1, Jung and Ecopsychology, examines the evolution of the Western dysfunctional relationship with the environment, explores the theoretical framework and concepts of Jungian ecopsychology, and describes how it could be applied to psychotherapy, our educational system, and our relationship with indigenous peoples. Volume 2, The Cry of Merlin—Jung, the Prototypical Ecopsychologist, reveals how an individual's biography can be treated as an ecopsychological exercise and articulates how Jung's life experiences make him the prototypical ecopsychologist. Volume 3, Hermes, Ecopsychology, and Complexity Theory, provides an archetypal, mythological and symbolic foundation for Jungian ecopsychology. I present Hermes as the god of ecopsychology and offer his staff as an emblem for ecopsychology. 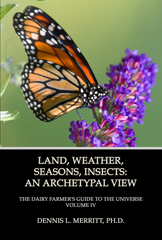 Volume 4, Land, Weather, Seasons, Insects: An Archetypal View (January 2013), describes how a deep, soulful connection can be made with these elements through a Jungian ecopsychological approach. This involves the use of science, myths, symbols, dreams, Native American spirituality, imaginal psychology, and the I Ching. Two promising areas are the Earth Charter which promotes “a sustainable global society founded on respect for nature, universal human rights, economic justice, and a culture of peace” (33) and the Transitions movement dealing simultaneously with climate change and peak oil. (34) Lester Brown's Plan B 3.O offers an astute and comprehensive analysis of environmental problems and many promising possibilities for tackling them in a Marshall Plan style. Ten years is not a long time to bring about a paradigm shift, Jung's New Age, but the stakes are high. We are creating the conditions that will literalize John's dastardly vision of an apocalypse as he described it in the Book of Revelation. 1. Ralph Metzner, 1993, “The split between spirit and nature in European consciousness,” Trumpeter 10, Winter 1993, p. 2. 2. http://www.independent.co.uk/life-style/health-and-families/health-news/experts-fear-diseases- impossible-to-treat-7216662.html retrieved November 8, 2012. 3. Lester Brown, 2008, Plan B 3.0: Mobilizing to Save Civilization, W. W. Norton & Company, NY, p. 69-75, 173-174. 4. http://www.reuters.com/article/2009/05/31/us-climate-oceans-E54U1ZB20090531 retrieved November 8, 2012. 5. http://www.climate.org/topics/health.html retrieved November 26, 2012. 6. http://www.nytimes.com/2009/08/09/science/earth/09climate.html?pagewanted=all&_r=0 retrieved November 26, 2012. http://www.truthdig.com/report/item/the_sky_really_is_falling_20110530/ retrieved May 31, 2011. 7. http://www.climate-emergency-institute.org/species_loss_robert_m.html retrieved November 26, 2012.
http://www.independent.co.uk/news/science/earth-faces-catastrophic-loss-of-species-408605.html retrieved November 26, 2012. 8. An excellent website for the latest reports from the Intergovernmental Panel on Climate Change is http://www.ipcc.ch/. Click on "Summary" and "Video". http://www.guardian.co.uk/environment/2008/apr/07/climatechange.carbonemissions retrieved May 31, 2009. Excellent updated information on the effects on the climate of the Canadian tar sands industry can be found at TarSandsRealityCheck.com. It counters the high-level pro-oil sands lobbying ongoing in Canada, the U.S. and Europe around the Keystone XL tar sands pipeline, and Europe on the Fuel Quality Directive. 9. James Hillman and Michael Ventura, 1992, We've had a Hundred Years of Psychotherapy—and the World's Getting Worse, HarperSanFrancisco, a division of Harper Collins Publishers, NY. 10. James Hillman, 1992, The Thought of the Heart and the Soul of the World, Spring Publications, Woodstock, Conn., p. 89-130. 11. http://en.wikipedia.org/wiki/Ecopsychology retrieved November 24, 2012. 12. Carl Jung, 1973, Letters, Vol. 1, 1906-1950, Gerhard Adler and Aniela Jaffe, eds., R.F.C. Hull, trans., Princeton University Press, Princeton, NJ, p. 285. 13. http://articles.latimes.com/2012/apr/11/nation/la-na-tennessee-climate-law-20120411 retrieved November 24. 2012. 14. Sigmund Freud, 1929/l961, Civilization and Its Discontents, James Strachey, trans., W. W. Norton, NY, p. 39. 15. Carl Jung, 1977, C. G. Jung Speaking: Interviews and Encounters, W. McGuire and R.F.C. Hull, eds., Princeton University Press, Princeton, NJ, p. 396, 397. 16. Carl Jung, 1969, Psychology and Religion: West and East, Vol. 11 of The Collected Works of C. G. Jung [CW], 2nd ed., H. Read, M. Fordham, G. Adler and W. McGuire, eds., R.F.C. Hull, trans., Princeton University Press, Princeton, NJ, par. 735. 17. Carl Sagan, “To avert a common danger,” Parade Magazine, March 1992, p. 10-12. 18. Dennis L. Merritt, 2012, Jung and Ecopsychology, Vol. 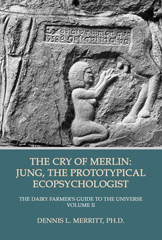 1 of The Dairy Farmer's Guide to the Universe—Jung, Hermes, and Ecopsychology [DFG], Fisher King Press, Carmel, CA, p. 54-70. 19. DFG Vol. 1, p. 46-49; Hermes, Ecopsychology, and Complexity Theory, DFG Vol. 3, p. 87-132. 20. DFG Vol. 1, p. 35, 36; DFG Vol. 3, Appendix C: Self and Organism, p. 190-195. 21. DFG Vol. 1, p. 109-124. 22. Barbara Hannah, 1991, Jung: His Life and Work, Shambala, Boston, p. 17; DFG Vol. 1, p. 25. 23. Peter Redgrove, 1987, The Black Goddess and the Unseen Real, Grove Press, NY, p. xiv, xv, xviii-xxix; DFG Vol. 3, p. 151-153. 24. Nancy Ryley, 1998, The Forsaken Garden: Four Conversations of the Deep Meaning of Environmental Illness, Quest Books, Wheaton, IL, p. 207, 208; DFG Vol. 1, p. 134 note 9. 25. Aldo Leopold, 1949, A Sand County Almanac and Sketches Here and There, Oxford University Press, New York, p. 201-226; http://home.btconnect.com/tipiglen/landethic.html retrieved November 24, 2012. 26. Jung 1977, p. 436. 27. CW 18, “Return to the Simple Life,” p. 582-588. 28. Cassandra offended Apollo and was cursed with the gift of prophesy but no one would believe her. 29. Carl Jung, 1984, Dream Analysis: Notes of the Seminar Given in 1928-1930 by C. G. Jung, W. McGuire, ed., Princeton University Press, Princeton, p. 538, 539, 542, 543; DFG Vol. 1, p. 77, 165 note 87. 30. Citizens United was a landmark 2010 Supreme Court decision that overturned decades of restrictions on corporations and unions from contributing unlimited funds to political campaigns, claiming the restrictions violate First Amendments rights of free speech. Corporations are considered to be a person in this regard. The 2012 elections were the first to experience the effects of the new law of the land. A "must see" 2003 documentary is "The Corporation," a film based on the book The Corporation: The Pathological Pursuit of Profit and Power by Joel Bakan, a University of British Columbia law professor. An excellent description of the film on Wikipedia (http://en.wikipedia.org/wiki/The_Corporation_%28film%29) lists the sociopath traits of a corporation if indeed it were a person, which means that the business form dominating the world's economic systems is sociopathic, period. Running beneath the credits at the end of the film is a list of websites that elaborate on particular topics and offers opportunities to get involved in rectifying the problem. 31. http://www.guardian.co.uk/environment/2006/sep/19/ethicalliving.g2 retrieved November 24, 2012.
http://www.guardian.co.uk/environment/2006/sep/20/oilandpetrol.business retrieved November 24, 2012. His video “Science vs the Feelies” makes some great points with good humor besides. 32. CW 8, par. 750. Prometheus was the Greek Titan who stole fire from the gods for human use, enabling progress and civilization. His punishment was to be chained to a rock and have his liver pecked out by an eagle, the emblem of Zeus. The liver grew back by the next day and again eaten, a scenario eternally reenacted.